While I’ve dabbled in MOBAs since the earliest days of DOTA, it was Riot’s League of Legends (LoL) that finally sucked me in. I started playing LoL in 2009, and haven’t really looked back since. Before Playerunknown’s Battlegrounds was released, my PC was used exclusively to play LoL with friends. I’ve played thousands of individual games, and have spent thousands of dollars in the game over the last eight years, slowly unlocking every champion and collecting a absurd amount of skins in the process. In fact, LoL is what brought me in to the esports fold, and I’ve since attended multiple League of Legends Championship Series games. What’s always been strange to me is that while I cannot get enough of LoL on my PC, mobile MOBAs really haven’t done anything for me with Call of Champions being the only one I stuck with for any significant amount of time. Sadly, it seemed the community died off pretty quickly, and with that, my interest in the only mobile MOBA I enjoyed. When Vainglory (Free) was released, it seemed like it checked all the boxes. It was one of the first games to boast full-on Metal support so it had some really great graphics, and they’ve even made a valiant effort at the whole esports thing. It never grabbed me for a few reasons: I end up playing most iOS games my iPhone since I always have it with me and it always felt like Vainglory was just objectively better on the iPad (like most games that use a tap to move mechanic). This eventually led to me only playing it when I was at home and had my iPad, but the time and attention requirements of Vainglory are pretty close to LoL, so any time I would have played Vainglory I just ended up playing LoL instead. I was never really that wild about the tap to move controls of Vainglory either. While playing a PC MOBA has you clicking a bazillion times to control your character, doing it via tapping always just seemed really stressful compared to how little I actually end up moving my mouse when playing a game like LoL. This control scheme always felt more awkward on the iPhone, as I don’t typically rest my iPhone on something while I play games like I do my iPad. I know loads of people, particularly high-ranking players love this control scheme, but it just never clicked with me. 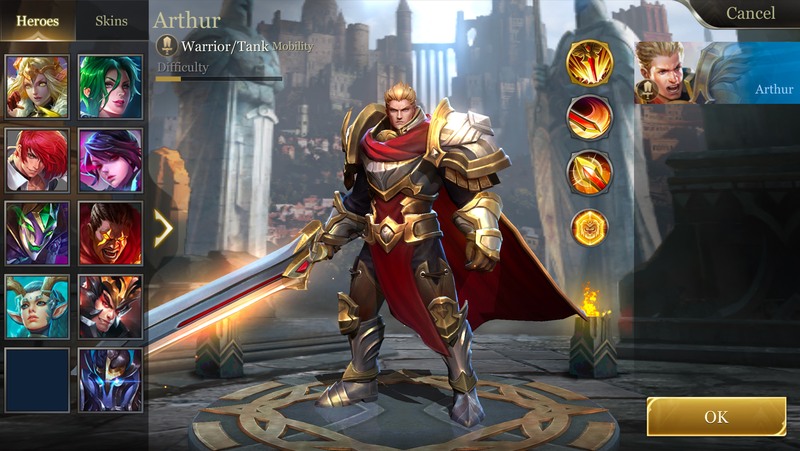 I’ve been closely following Arena of Valor (Free) since it was titled Honor of Kings. Originally it was just as a curiosity as the game is published by Tencent, which entirely owns Riot Games, the creators of League of Legends. They basically repackaged LoL for Chinese smartphones, and in the process created a game that grew so massive it even drew the ire of the Chinese government. It’s difficult to imagine a reality where a mobile game could get so huge that it pops up on any government radar, but, here we are. I pretty much assumed that much like every other mobile MOBA, Arena of Valor wouldn’t appeal to me much beyond the idea of trying out the not-quite-League on my iPhone. Well, the game “soft launched" today in North America, and I’ve been putting off things which normally are fairly important to me, like eating, working out, and showering, to sneak in just one more match of Arena of Valor. 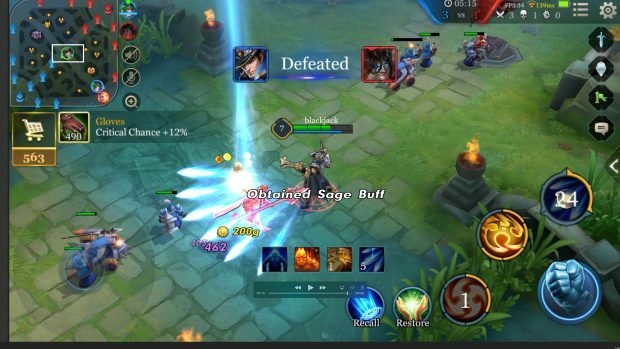 At its core, Arena of Valor is a pretty typical MOBA. You play in 5v5 games on a map with three lanes, and multiple layers of towers, culminating in an enemy base you need to destroy and a base on the other side that you need to protect. Games seem to last around 15 minutes, which is pretty typical of most mobile MOBAs. There’s also a 3v3 mode which lasts around 5 minutes. Sort of similar to LoL’s ARAM mode, there’s a single lane map as well that can be played either 5v5 or 1v1 if you’re more into team fighting and less into typical map objectives. The least interesting game mode to me is a deathmatch last man standing sort of thing, but, it’s cool that it’s there for folks who are into it. The rad part of North America getting Arena of Valor so late, compared to the Asian and European launches is that the amount of heroes in the game is really just absurd. 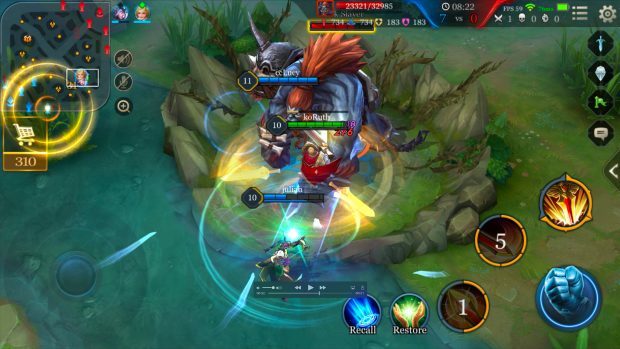 Typically with mobile MOBAs, a game will launch with maybe a dozen different heroes and then the game is maintained via a constant drip cycle of introducing new characters. Arena of Valor has 38, and the goofier heroes in the other regions (Batman, Superman, and others?) aren’t yet available, so Tencent is definitely holding back. Even so, 38 playable characters in a new game? That’s wild. Like most MOBAs, heroes are a bit on the expensive side. If you want to buy them with actual cash, they’ll run you $5-10 a pop. I’m not super sure why you’d race to buy a bunch of character unlocks, as you have access to a pool of seven free heroes as well as 14 additional heroes that you can unlock each day by playing three games. So, after playing for a while you’ll effectively have access to 28-ish characters depending on the overlap of the current freebies and the ones you have unlocked. Arena of Valor has what seems like the best overall first time user experience of any MOBA I’ve played. In fact, I think I’m just going to use this game as a way to teach friends how to play League of Legends. It starts off with the extreme basics of explaining the basic concepts of the game, and as your account levels up, you’re slowly exposed to new subsystems so there’s never really a point where anything feels overwhelming. The way the cadence of this seems to work is you go through the tutorial, play a few games, gain enough experience to level up, at which point Arena of Valor teaches you the next tiny thing you should know, and then those last two steps repeat until you hit max level. For a person like me who plays MOBAs for fun, and not necessarily to be a professional, top-tier esports guy, Arena of Valor is an absolute joy to play. Instead of frantically tapping, you move your character using a virtual joystick on the left side of the screen and control your actions with virtual buttons on the right side of the screen which also display each individual ability’s cooldown. If an ability needs to be aimed, you drag the ability button in that direction. I seriously just love how this works, as the control scheme of Call of Champions was very similar. It also works flawlessly on the smaller screen of the iPhone. I’ve read complaints from people that say this isn’t anywhere near as good for top-tier players compared to tap to move, but honestly, I really don’t care. I think it’s way smarter to design your control scheme around what’s fun for casual players like me than focusing on what’s going to be best for top-tier players. The gameplay of Arena of Valor is super fun, and unsurprisingly is almost exactly like League of Legends. Most of the heroes are practically identical as well. Arthur in Arena of Valor is Garen from League of Legends, just with a different skin. It does seem more than a little silly that all the characters were renamed, with many voice lines being shuffled around, instead of just keeping everything in line between the two games. There’s a Baron and Dragon equivalent, creeps in the jungle, and the map even looks the same visually. The whole thing is a little strange, as it feels like a rip-off in a way, but if you own the thing you’re ripping off, is it still a rip-off? I’m really just beside myself with how much I’m enjoying Arena of Valor. I really only originally downloaded it just to see what all the fuss was about, and definitely did not expect to find my next obsession. I guess it makes sense, as Tencent is currently boasting over 100m daily active players, and I really don’t think they could maintain that kind of playerbase if the game was anything short of world class. I’ve been playing all day, and I still feel like I’m barely scratching the surface. The only real annoyance I have it is isn’t optimized for the iPhone X, but, I imagine that can’t possibly be that far off. From where I’m sitting, Arena of Valor is the best MOBA on the App Store, and even if you don’t care at all about the genre you owe it to yourself to check this one out. I have no idea of the game is going to be as much of a sensation in North America as it is in China, but honestly, it really wouldn’t surprise me. Now, if you’ll excuse me, I’ve got more games to play.